Ever since the world wide web went public in 1993, we have traded our personal data in return for free services from the tech giants. Now a growing number of start-ups think it's about time we took control of our own data and even started making money from it. But do we care enough to bother? 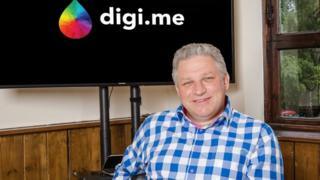 Julian Ranger, founder of Digi.me, says working on a turkey farm in his teens was "the making of me". Other odd jobs included being a cleaner and a head barman at a nightclub. But an aeronautical engineering degree and a flair for coding eventually saw him working on Tornado F3 fighter jets and developing "the aeronautical internet" - a way for weapons systems to communicate securely. "The current dialogue is about sharing less data, but that's worrying. We're not going to get personalised medicine unless we share more data," he says. The Digi.me app enables people "to build a private, highly secure, complete searchable library of your data". Image caption Digi.me acts like a guardian of all your personal data, but do consumers think they need it? "The data never leaves your device and we never see it. Businesses just access the information it contains. This could be a life insurance company offering health advice and lower premiums because it knows your medical history, for example," he says. Digi.me, which took six years and £18m to develop, has more than 100,000 users so far and recently signed an agreement with the UK's National Health Service to allow health data within the app. "The initial release will cover about 45% of the population," says Mr Ranger. Users can then decide who they want to share their health data with. "We're industrialising the collection, storage and encryption of all your data on your device. We're changing the world," he says. "This is a social good. I could fail, but this idea will not fail." Fighting talk. But the recent revelation that Facebook plans to integrate its Messenger, WhatsApp and Instagram messaging services emphasises just how much power the social media giant has accrued - power it has abused by giving app developers access to our data without our explicit consent. "Facebook says you own your data, but that's like saying you own your body when you're a slave," says Irene Ng, founder of Hub of All Things (HAT) and a professor of marketing and service systems at Warwick University. HAT, a collaboration between seven British universities, has created a cloud-based "microserver" it calls a HAT, that acts like a mini fortress for all your personal data. You can decide how to "spend" your data because you own the database. "We really believe in the data economy, we want more data sharing," explains Ms Ng, "but you should have legal rights to share your data with whoever you want in the way you want." It is an ambitious scheme facing huge challenges around public understanding - only 1,800 HATs have been issued so far - but Ms Ng is convinced the system has the potential to go global. Other players in the "citizen data" space, such as People.io and Citizen.me, are giving users the chance to earn small amounts of money in return for willingly participating in quizzes and questionnaires whose answers are useful to marketers. But as it can take "six to eight weeks to earn around £10", admits People.io chief executive Nicholas Oliver, "the challenge is getting a person to care enough about their data to want to control it and spend the effort doing it". Young people engage with the Tinder-style app - which has been downloaded more than 150,000 times - primarily because they find it fun, he says. Apps that integrate with the People.io system will be able to offer personalised services, whether that's bespoke Spotify playlists or curated news headlines based on what you're currently doing, says Mr Oliver. "We're trying to create a democratised set of the data Microsoft, Amazon, Google and Apple have on you." Web creator Tim Berners-Lee has set up a project called Solid in partnership with the Massachusetts Institute of Technology, which is a way of giving users "the freedom to choose where their data resides and who is allowed to access it". This is an open-source platform that separates the app program from the data it generates, enabling users to create their own "personal online data store" (POD) they control. But the formidable challenge for all these services aiming to give citizens control over their own data is that developers need strong incentives to build apps on their platforms and we need to be persuaded that it's worth participating. "There is real potential for third-party mechanisms to give individuals more control over their data," says Roger Taylor, chair of the UK government's new Centre for Data Ethics and Innovation, "and perhaps also to act on behalf of groups of customers to check that they are being treated fairly. But these intermediaries need to secure the trust of people, while also establishing a sustainable business model." Despite the Facebook-Cambridge Analytica scandal of 2018, which led to $120bn (£92bn) being wiped off the firm's stock market value, global user growth continues, albeit at a slower pace. It now has more than 2.2 billion monthly active users. Instagram has grown to more than a billion users. People have short memories it seems, or perhaps we just don't care enough about the privacy and security of our data. But the fightback is beginning.